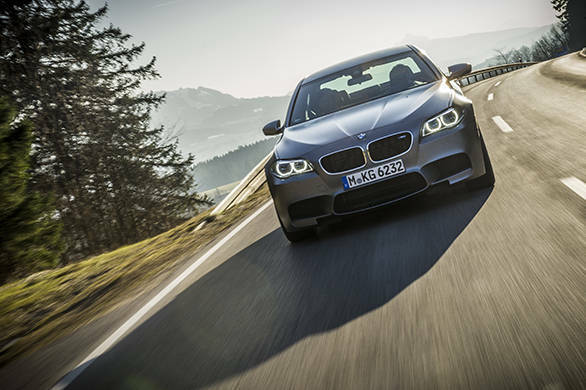 It's hard not to be smitten by the BMW M5. And it isn't just the matter of the new 560PS output from the tweaked 4.4-litre V8 that gets two TwinPower (as in twin scroll turbochargers, two of them). The power certainly is a part of it but there is something special about the M5. 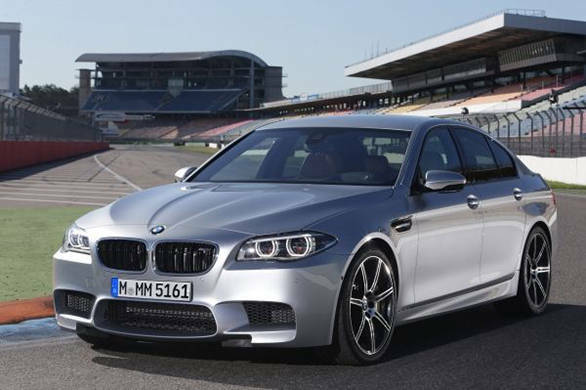 And for 2014 there is also a special M5, the 575PS one that wears the optional Competition Package that allows you to enjoy 15PS more power over the base model while the top speed, normally restricted to 250kmph, goes up to a restricted 305kmph. I'd love to tell you how 305kmph feels but that's a story for another day. 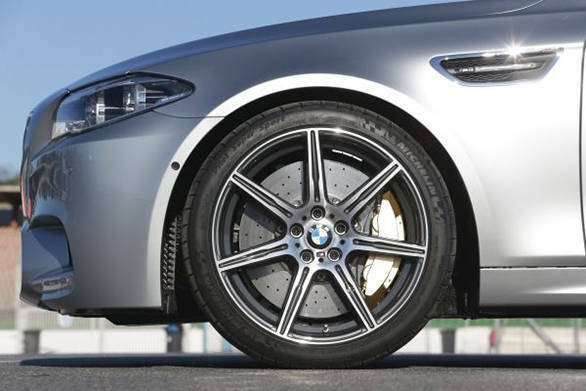 Our test car was still running winter tyres (and hence not the actual M5 stock 20" rims either) rated only to 240kmph. And 240kmph on the no speed limit stretches of the German autobahn is easy for this car. It goes like this. You're going at 130-140kmph. Then you decide to speed up a bit. You press down gently on the throttle. The V8 rumble turns into a roar. And then the head up display goes nuts. 140. 168. 190. 221. 245kmph. Done. All the tech in the engine gives it a stunning turn of speed although even with all the creature comforts backed off the M5 gains ferocity and feel without really ever becoming outright violent. Yes creature comforts. The M5's speciality was always that it managed to blend a surprisingly practical automobile with a astonishingly fast powertrain. 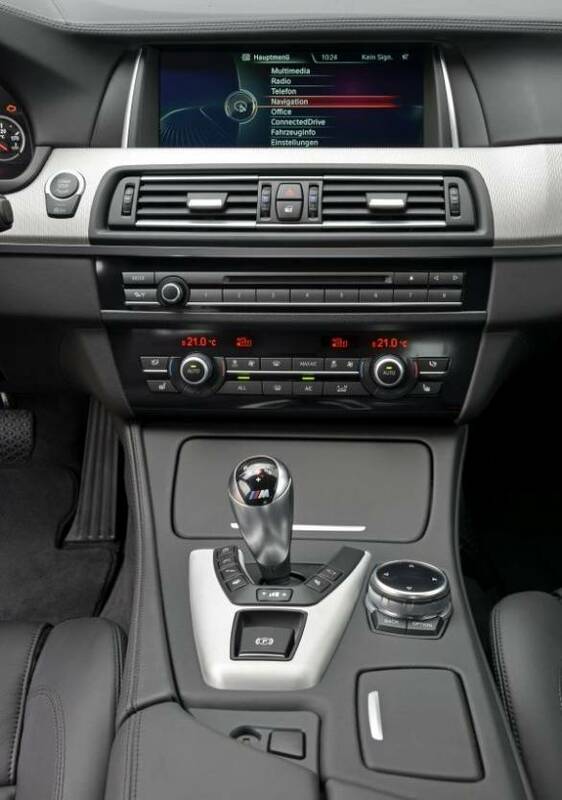 The arrival of things like adjustable suspension, adjustable steering, adjustable gearboxes that can alter when they shift up or down and what have you makes the M5 rather good at comfort. We drove the previous model (from this generation) for quite a while in Mumbai and in comfort mode it was a car you could live with easily. You wouldn't mistake the ride for a much more plush 5 Series sedan but it only became rock hard and jittery when you switched the suspension to the harder, more performance oriented modes. This one is even better. Driving around all kinds of roads, the M5 was able to effortlessly deliver as intense a ride as I wanted while always keeping a lively V8 burble up that told you shattering performance was just a moment away at all times. The 2014 engine is similar to the previous one offering 10 per cent more power on top. But with almost 10kmpl on the European driving cycle, BMW says the economy is up as much as 30 per cent and the M5 is EU5 ready. It's easy to forget in all this green-tinged talk this is still a very fast car. 100kmph in 4.3 seconds (4.2 with the Competition Package ). Give it 12.9 seconds (12.7s) and you get 200kmph! It's not hard to see why either. From 1500rpm to 5800rpm, the car sits at peak torque and then the peak power arrives and stays till over 7000rpm. The new 7-speed M DCT, BMW M's new transmission manages the delivery of all the power. BMW still prefers the purity of the rear wheel drive platform and in a recent interview M boss Nitschke said clearly that four-wheel drive wasn't something M was going to do outside of the SUV lines. 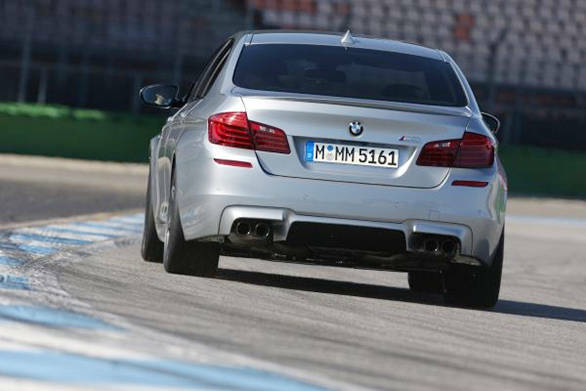 Which is why the M5 gets a active rear M differential that is an electronically controlled limited slip differential allows then full range of torque control to either rear wheel, from none to all and any ratio in between. The car also gets dynamic damper control, special M compound brakes and you can opt for the optional M carbon ceramic brakes as well. 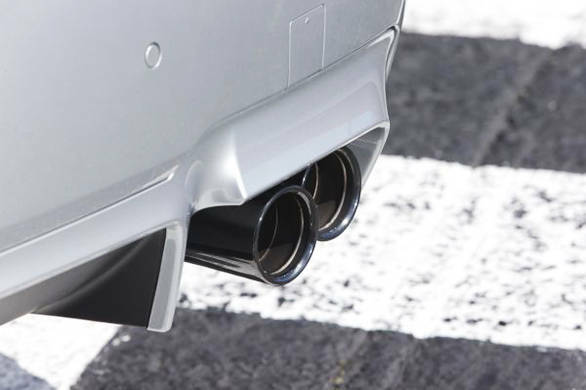 All that ensures that when you floor the throttle, the M5 gathers itself up for a moment and then with the lovely thunder from its quad exhausts absolutely spears into the distance. While any corners are dispatched by an intensely involving chassis and chassis electronics package that works very hard to remain as unobtrusive as possible. 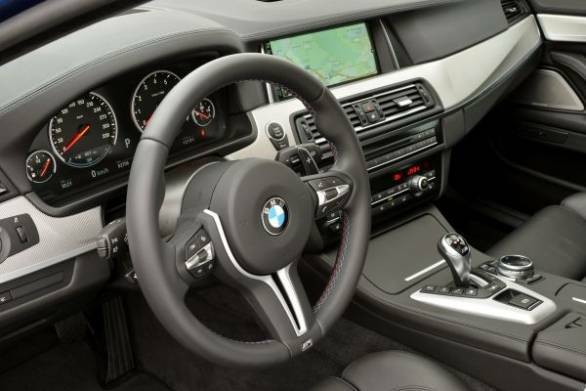 Given how adjustable the car is, BMW have also chosen to put in the new M steering wheel which incorporates two memory buttons. The buttons call up your favourite combination of suspension, gearbox and steering settings so you can, for example go from a fully comfort oriented grand tourer to a no holds barred track demon at the press of a button. The car gets dynamic damper control, special M compound brakes and you can opt for the optional M carbon ceramic brakes as well. The 2014 update is, however a minor update. Which means the rest of the cabin is pretty familiar and the updates are minor. As usual, BMW's head up display is excellent at displaying relevant information just where it's needed. Outside, again, there are minor changes. So the same silhouette now gets new mirrors, new M gills, the kidney grille gets the twin spoke treatment plus bits. The lights are less fussy in their internal design and you get BMW's excellent adaptive LED headlights as an option. The updated M5 is, as expected, fast, sharp and comfortable. What we haven't mentioned are all the updates to the other systems like the lane departure warning, collision warning, pedestrian recognition from the camera etc. They're all updated but they're a bit peripheral to the core of the M5 experience. It's that blend of characteristics that make such a hard car not to love. The only catch is the price. The 2014 M5 should go on sale in India by the last quarter of this year and we expect the price to rise by a small amount. Which means the base car should be about Rs 90 lakhs or so.